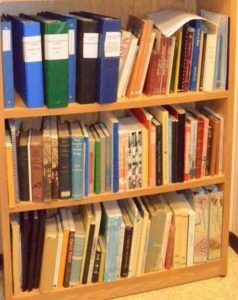 This BCHNS Archival collection consists of approximately seventy-five books. The majority are of historical interest containing histories of schools of nursing and nursing associations in British Columbia and across Canada. Others contain fascinating histories of nursing through the ages, Florence Nightingale, nursing education, military nursing, public health nursing and world-recognized nursing leaders. They will be of interest to those researching the historical status of nursing and the wealth of knowledge and commitment of nurses in our time and before. Alderson, Henrietta Jane. Twenty-five Years A-Growing: The History of the School of Nursing, McMaster University. Hamilton, Ontario: McMaster University, 1976. Anderson, Peggy. Nurse: The True Story of Mary Benjamin, R.N. New York: St. Martin’s Press, 1978. Anton, Gayle et al. “Tranquille” and other papers presented in partial fulfillment of the requirements for Nursing 404: “Professional Issues in Nursing and Health Care” at the University College of the Cariboo in Kamloops, 1992. Barritt, Evelyn R. and ed. Illus. Jeff Hill. Florence Nightingale: Her Wit and Wisdom. Mount Vernon, New York: Peter Pauper Press. 1975. Baumgart, Alice J. and Larsen, Jenniece. Canadian Nursing Faces the Future: Development and Change. Toronto: The C.V. Mosby Company, 1988. Beck, Amanda K. Reference Handbook for Nurses. Sixth Edition. London: W.B. Saunders Company, 1929. Boschma, Geertje. Faculty of Nursing on the Move: Nursing at the University of Calgary, 1969-2004. Calgary: University of Calgary Press, 2005. 2 copies. Bourne, Aleck W. Midwifery and Gynaecology. Third Edition. Bristol, England: John Wright & Sons Ltd., 1925. Bowen, John. Florence Nightingale: A Play. London: Samuel French, 1976. From Lois Blais’ records. Broomfield, Velda, Marilyn Brown and Queenie Hammell. A History of the Royal Columbian Hospital School of Nursing Commemorating Its Diamond Jubilee – 1901-1976. New Westminster, 1976. Canadian Association for the History of Nursing/Association Canadienne pour L’histoire du Nursing. Guide to Canadian Nursing Archival Resources. N.d.
Canadian Association for the History of Nursing Third Annual Conference. “Proceedings.” Palliser Hotel, Calgary, June 27-28, 1990. Canadian Journal of Nursing Research. 40th Anniversary: A Ten Year Perspective, 41, (1) March 2009. Canadian Nurses’ Association. The Leaf and the Lamp. Ottawa, 1968. Cantwell, Sister Margaret, in collaboration with Sister Mary George Edmond. Foreword by the Honorable Walter J. Hickel. North to Share: The Sisters of Saint Ann in Alaska and the Yukon Territory. Victoria: Sisters of St. Anne, n.d.
Carpenter, Helen M. A Divine Discontent: Edith Kathleen Russell, Reforming Educator. History monograph 1. Faculty of Nursing, University of Toronto, 1982. Carter, Doris V. Never Leave Your Head Uncovered: A Canadian Nursing Sister in World War Two. Waterdown, Ontario: Potlatch Publications Limited, 1999. Cashman, Tony. Heritage of Service: The History of Nursing in Alberta. Edmonton: The Alberta Association of Registered Nurses, 1966. Cavers, Anne S. Our School of Nursing 1899 to 1949. Vancouver General Hospital School of Nursing. Vancouver, ca. 1949. [Coles, Laura]. Survey of Nursing History Materials in British Columbia. Registered Nurses Association of British Columbia, December 1990. Desjardins, Edouard, with Eileen C. Flanagan and Suzanne Giroux. Heritage: History of the Nursing Profession in Quebec from the Augustinians and Jeanne Mance to Medicare. Adaptation from the French by Hugh Shaw. The Association of Nurses of the Province of Quebec, 1971. Diary of an Unknown Nurse who worked in Alberta and B.C. for the Federal Indian Health Services as a ‘travelling nurse’ during the 1920’s & 1930’s. B.C. History of Nursing Society Archives, 2013. Author unknown—possibly Mary Stewart. Dietz, Susanne Malchau, ed. Proceedings of the First Danish History of Nursing Conference. Aarhus University, Denmark: Faculty of Health Sciences, 2009. Dock, Lavinia L., Stewart, Isabel. A Short History of Nursing: From the Earliest Times to the Present Day. Fourth Edition. London: G.P. Putnam’s Sons, 1938. (Includes note by Esther Paulson). Echo Memoirs. St. Paul’s Hospital: A Proud Tradition of Compassionate Care. Echo Memoirs: Vancouver, 2007. Emory, Florence H.M. Public Health Nursing in Canada: Principles and Practice. Toronto: the Macmillan Company of Canada Limited, 1945. Gibbon, John Murray, in collaboration with Mary S. Mathewson. Three Centuries of Canadian Nursing. Toronto: The Macmillan Company of Canada Limited, 1947. Green, Monica M. Through the Years with Public Health Nursing: A History of Public Health Nursing in The Provincial Government Jurisdiction of British Columbia. Ottawa: Canadian Public Health Association, 1984. Guide to the Definition of the Roles and Functions of the Licensed Practical Nurse, the Registered Nurse and the Psychiatric Nurse. A Joint Statement of the Licensed Practical Nurses’ Association of British Columbia, The Registered Nurses’ Association of British Columbia, and The Registered Psychiatric Nurses’ Association of British Columbia, February, 1977. Hamley, H.R. and Muriel Uprichard. A Study of the Florence Nightingale International Foundation. Printed by London: Welbecson Press, 1948. Jamieson, Elizabeth M., Mary F. Sewall and Lucille S. Gjertson. Trends in Nursing History: Their Social, International and Ethical Relationships. Fifth Edition. London: W.B. Saunders Company, 1959. Johns, Ethel, ed. Just Plain Nursing. London: J.B. Lippincott Company, 1953. Kelly, Nora. Quest for a Profession: The History of the Vancouver General Hospital School of Nursing. Vancouver: Vancouver General Hospital School of Nursing Alumnae Association, 1973. 2 copies. Kermacks, Claire. Nursing Education Study Report. Ministry of Education, Science, and Technology, Province of British Columbia, April 1979. Landells, E.A., ed. The Military Nurses of Canada: Recollections of Canadian Military Nurses. White Rock, B.C. : Co-Publishing, 1995. ——, The Military Nurses of Canada: Recollections of Canadian Military Nurses. Volume II, White Rock, B.C. : Co-Publishing, 1999. ——, The Military Nurses of Canada: Recollections of Canadian Military Nurses. Volume III, White Rock, B.C. : Co-Publishing, 1999. LaSor, Betsy, and Ruth M. Elliott. Issues in Canadian Nursing. Scarborough, Ont. : Prentice-Hall of Canada, Ltd., 1977. Leibel, B.S. and Wrenshall, G.A.. Insulin. Canadian Diabetic Association, 1971. The Love Story of Florence Nightingale and John Smithurst, Issued by The Church of St. John the Evangelist, Elora, Ontario. 2 copies. 1 copy includes “Historical Notes”. Lovell, Verna. ‘I Care that VGH Nurses Care!’ A Case Study and Sociological Analysis of Nursing’s Influence on the Health Care System. Vancouver: InTouch Publications Limited, 1981. MacDermot, H.E. History of the School for Nurses of the Montreal General Hospital. Montreal: The Alumnae Association, 1940. MacLaggan, Katherine. Portrait of Nursing: A Plan for the Education of Nurses in the Province of New Brunswick. Fredericton, New Brunswick: The New Brunswick Association of Registered Nurses, 1965. Murphy, Herbert H. Royal Jubilee Hospital, Victoria, B.C. Victoria: Hebden Prining Co. Limited, 1957. Mussallem, Helen K. Nursing Education in Canada. Royal Commission on Health Services, 1964. Nicholson, C.W.L. Canada’s Nursing Sisters: Toronto: A.M. Hakkert Ltd., 1975. Nightingale, Florence. Letters from Egypt: A Journey on the Nile 1849-1850. Selected and introduced by Anthony Sattin. London: Barrie & Jenkins, 1987. ——. Notes on Nursing: What It Is, and What It Is Not. London: Harrison, 1859. Rpt. London: J.P. Lippincott Company, 1946. 2 copies. Rpt. Birmingham, Alabama: Classics of Medicine Special Edition, 1982. Norris, Marjorie Barron. Sister Heroines: The Roseate Glow of Wartime Nursing 1914-1918. Calgary: Bunker to Bunker Publishing, 2002. Ratzlaff, Jacqueline. “Memories of Scharley Wright Brown and Helen Randal”. From an interview with Esther Paulson, New Westminster, B.C. : September 29, 1993. “The Recognition of the Common Forms of Hepatic Disease.” 1950. Riegler, Natalie. Jean I. Gunn, Nursing Leader. Markham, Ontario: Fitzhenry and Whiteside, 1997. In Canadian Medical Lives Series, ed. T.P. Morley. Roberts, Mary M. American Nursing: History and Interpretation. New York: The Macmillan Company, 1954. Robson, Reginald Arthur Henry. Sociological Factors Affecting Recruitment into the Nursing Profession. Royal Commission on Health Services, 1964. St. John Ambulance Association. First Aid to the Injured. Thirty-Ninth Edition. London: The St. John Ambulance Association, ca. 193-. Simpson, Sharon and Karen Abbott. Traditions and Transitions: History of the Nursing Programs at Thompson Rivers University, 1973-2003. Thompson Rivers University, Kamloops, 2010. Splane, Richard B. and Verna Huffman Splane. Chief Nursing Officer Positions in National Ministries of Health: Focal Points for Nursing Leadership. University of California, 1994. Spotlight on Education:The Report of the Pilot Project for the Evaluation of Schools of Nursing in Canada. Director: Helen K. Mussallem. Ottawa:The Canadian Nurses’ Association, 1960. Standards on Education: The Report of the Pilot Project for the Evaluation of Schools of Nursing in Canada. Director: Helen K Mussallem. Ottawa: The Canadian Nurses’ Association, 1960. Stewart, Isabel, Austin, Anne. A History of Nursing: From Ancient to Modern Times. Fifth Edition. New York: G.P. Putnam’s Sons, 1962. Stinson, Shirley M., Joy L. Johnson and Glennis Zilm. History of Nursing Beginning Bibliography: A Proemial List with Special Reference to Canadian Sources. Faculty of Nursing, University of Alberta, 1992. Street, Margaret M. Watch-Fires on the Mountains: The Life and Writings of Ethel Johns. Toronto: University of Toronto Press, 1973. “Symbol of a Profession: One Hundred Years of Nurses’ Caps.” Photographs from the Gloria Kay Nurses’ Caps Collection at the Canadian Museum of Civilization. Thuillier, Daphne and Swan, Bruce. A Century of Caring: The Story of Vernon Jubilee Hospital and of Men and Women Who Have Made Its History. Vernon: Vernon Jubilee Hospital, 1997. Tunis, Barbara Logan. In Caps and Gowns: The Story of the School of Graduate Nurses, McGill University. Montreal: McGill University Press, 1966. Weir, G.M. Survey of Nursing Education in Canada. Toronto: University of Toronto Press, 1932. Wherrett, George Jasper. The Miracle of the Empty Beds: A History of Tuberculosis in Canada. Toronto: University of Toronto Press, 1977. World Health Organization: The First Ten Years of the World Health Organization. Geneva, 1958. World Health Organization: The Second Ten Years of the World Health Organization 1958-1967. Geneva, 1968.